Most of our trees are "container-grown" making it easier for transport and planting. Our container sizes are 5 gal., 7 gal., 15 gal., and 25 gal. Often we may supply 30 gal. or above. 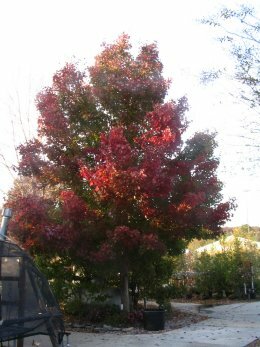 We offer container trees all year, but larger trees may be dug during the dormant season, beginning in November, after frost. Digging continues until about April. You’ll find shade trees, flowering trees, fruit trees, and others. 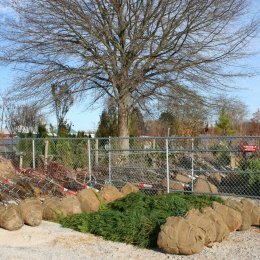 Our landscaped displays at the nursery include many mature trees so you can see how they grow. Most trees are in our area #4 or our South Tree Lot. If we don't have it in stock, just ask, we will try to order for you.